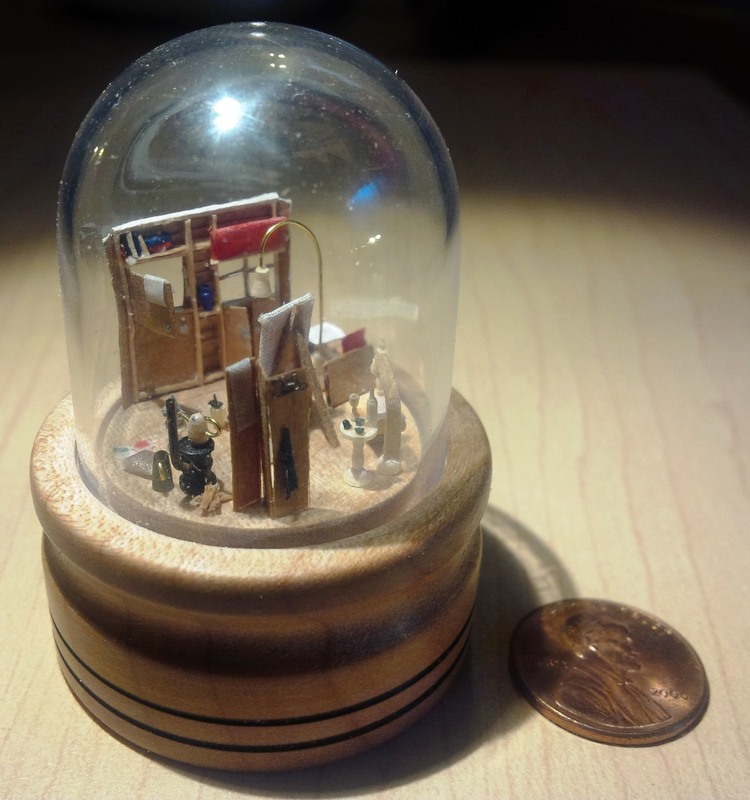 It’s February, which can only mean it’s almost time for this year’s MicroMinis 1/144-scale online convention! Even though it’s a virtual conference, the fact that it’s happening online means that the wide spread of members can access it from all over the world. And as we take our virtual seats at those conference tables, we eagerly anticipate a dozen or so very tangible centerpieces! 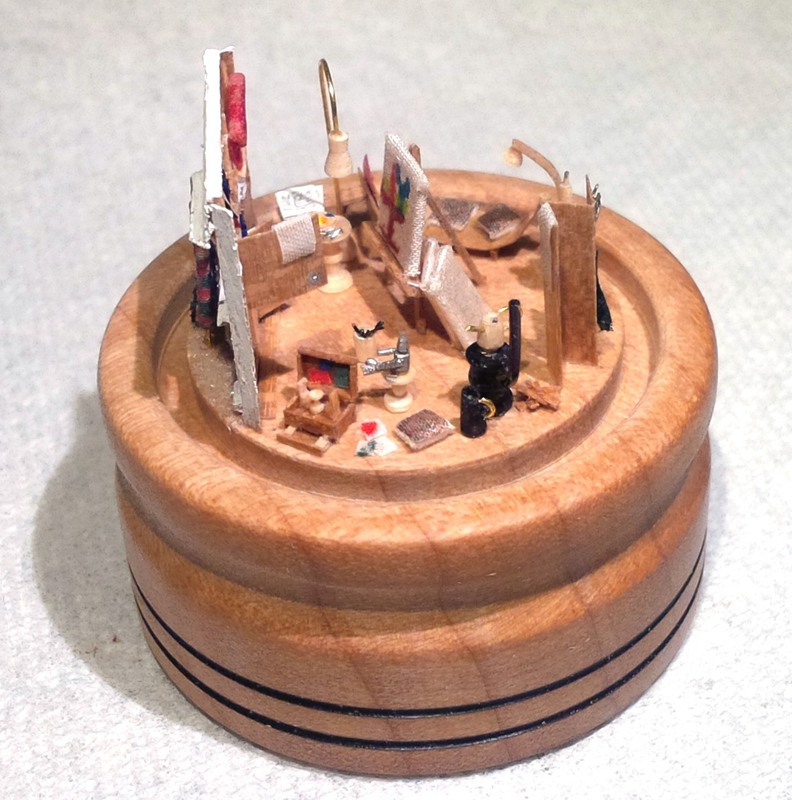 One of the pieces still under construction is this wee art studio (about 25 mm or ~1″ across). If you look closely, you’ll see a little tin man sitting to one side. 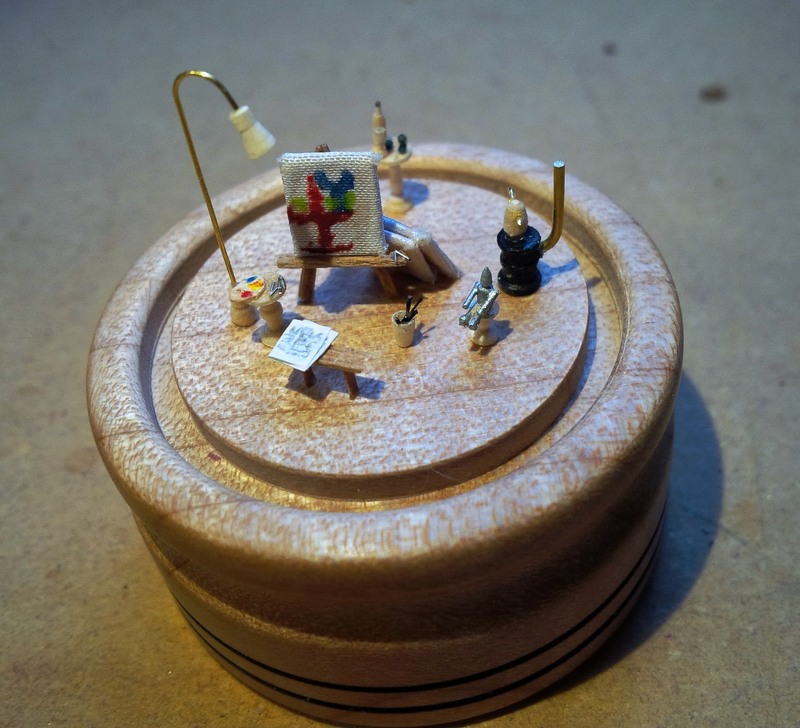 Whether he is waiting for a miniature oil can or a cup of tea, or whether he’s just pondering life as a still, the storyline is up to you… I invite you to add your suggestion now to grow the contents of this scene, which will be fully updated in the next couple of days. Then it will be winding its way in the official convention-supplied dome to take its place at one of those online tables. It’s filling up! Thanks to your suggestions, there is now a bench for the artist to rest on, complete with a copy of his favourite newspaper, there’s also a bucket with paint brushes and a scattering of paint tubes. The stove has its chimney, and there’s more brewing…let me know what’s missing from the scene! Another day, another few additions. The cabin is filling up so much that a simple picture no longer does it justice: bring on the turn table, switch the camera to video mode, and see it from all sides. Add a bit of sand in front from the beach, a chaise-lounge with cushions for the model to rest on, some rags lying about, a room divider screen should the model wish for some modesty while changing, and even a few coat hangers on the divider to hang clothes on. And now also an umbrella and fish net, a reading light over the chaise-lounge, a coal bucket (with some wood nearby to burn too), even an artistic sculpture and a large portfolio with sketches. Also a blue turned vase in the alcove next to the door, and a red roller blind for the window. See if you can spot them all. Any more to add? Smaller items I guess, to fill in those last gaps? If you look carefully over the door, you will see some books lying about on the shelf. The dome keeps it all safe, and Lincoln is in attendance to show us its size. 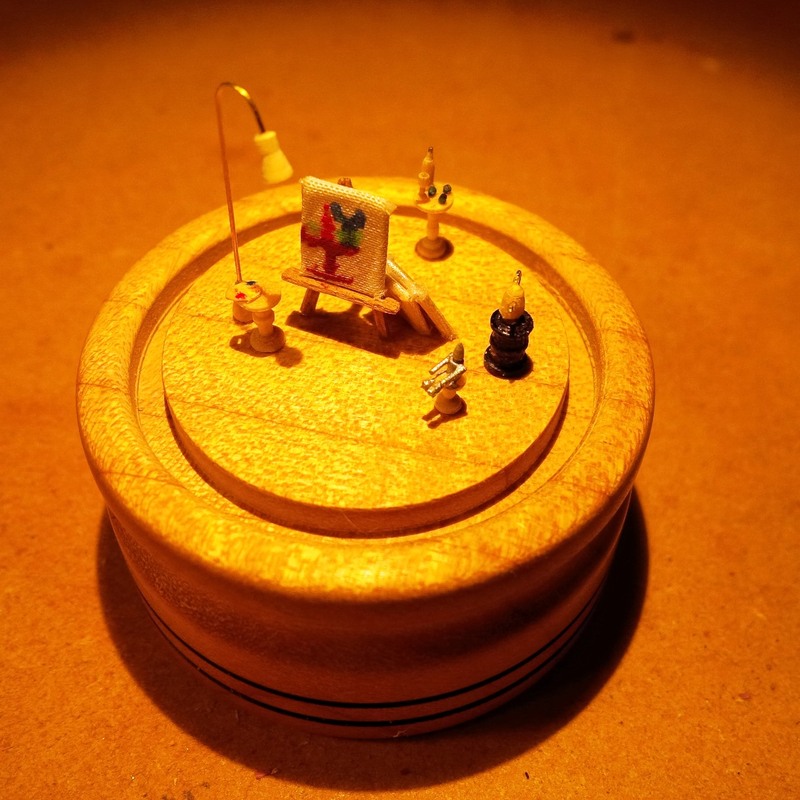 It is about 3 x 4 mm, just right for the artist to use. I think one reason why it looks bare (referring to the comment you made on the list) is the lack of color (except the painting). The “floor” really accents that things are just “put” there rather than “put” in a scene… you have the “props”, which are exquisitely lovely!! !, now the scene around it needs development. I filled it up a bit, and with the wall in place, I would hope it looks more like a scene, thanks for the suggestions. Thanks for the nice comments, but as Vinny does not have a passport, and I live in Canada, I’m afraid that the cunning plan does have a flaw. You will just have to hope and be lucky, and at least it is not up to me to decide who gets it in the end. Maybe I will just keep it for myself and send a few printies instead. Saves on mailing cost, and it will stop others from being jealous of each other. Better all round. Hi…how about a few tubes of paint lying on the floor…under and around the easel…paint brushes in a jar….piles of old newspapers…it looks very good. as you can see paintbrushes, tubes of paint, and a newspaper have been added. Next a few rags, and whatever else everyone comes up with. This looks wonderful!!!! As to suggestions, I would add paintbrushes, paint tubes or jars, and a few speckled rags (or ones with runs from drying brushes. I really would not want to cover up the floor too much as it lends to the scene. 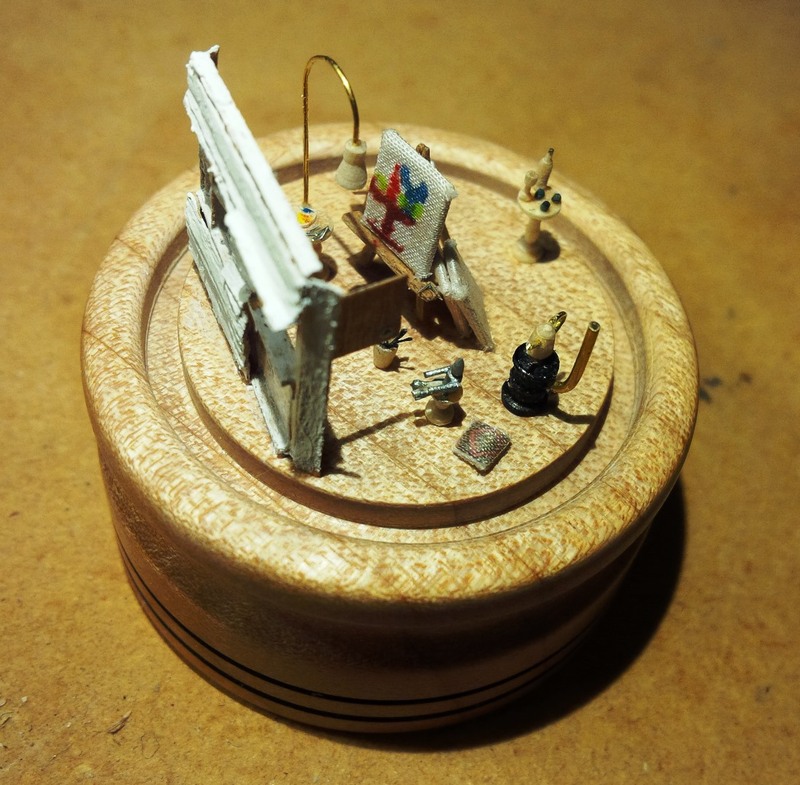 Great mini-making!!! I have no idea as to which table this centerpiece is going, I suppose Laura will organize the draw. I am trying figure out what the tin man is doing. Also had to figure out the stove and its pipe. And whomever receives it will be lucky indeed. I’m still trying to find out what the tin man is doing too, he just showed up…..
Maarten I love it, so beautifully made and so many details, one very lucky person who will have the real thing but I’ve enjoyed seeing it through the video, thank you.